Today, in America, we celebrate freedom. And we should. We are fortunate to live in a nation that provides the liberties our's provides. We should never take those for granted. 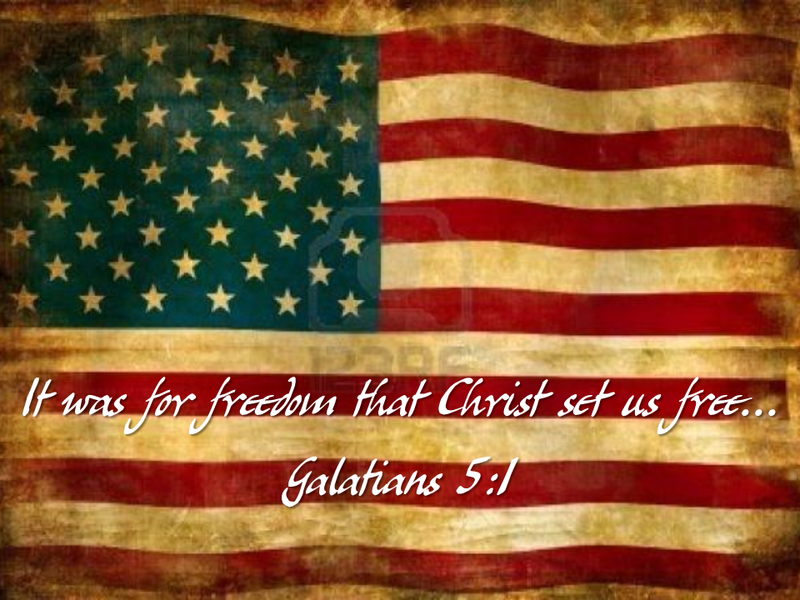 As I wrote in the Top 15 Bible Verses on Freedom, freedom does not come from government. Nor can freedom be taken from us by government. Freedom is not an expanding and contracting list of rights or system of prohibitive or permissive laws. It is not found in a document or series of documents declaring independence or setting forth unalienable rights. To the extent we measure freedom by what is permitted or restricted by government, our freedom is limited. True freedom is a gift from God. The freedom offered by God, through Jesus, is freedom from oppression, spiritual and physical, freedom in your thought-life, freedom from disease and addiction, freedom from the chains of unforgiveness, freedom from the anxieties and stresses of this fallen world. Freedom is God's peace of mind. His shalom peace. God's idea of freedom is quite different from our's. Our notion of freedom is rooted in terms of permission. "It's a free country!" If we are allowed to do something, we are free. If we are not, our freedom is somehow restricted. While this is certainly an aspect of freedom, it is only a small part of the whole. While a slave, Joseph became in charge of Potiphar's house, and while imprisoned he became second in command of all of Egypt. Peter was imprisoned, chained, and asleep between two guards with soldiers guarding the prison gates when an angel escorted him right out the front door. While in prison, Paul and Silas prayed and sang hymns, their chains fell off, the prison doors flung open, but they remained. Neither Joseph, nor Peter, nor Paul were technically "free" as we tend to view freedom, but the message of the gospel is that regardless of your condition, you can experience God's freedom. The gospel is a proclamation of freedom - freedom to experience God's shalom peace. This is true freedom. The gospel is the Christian Declaration of Independence, and God's Word is our Constitution.